A Waterpik is a dental tooth that is used in a way similar to traditional flossing—but instead of using a thread, it uses water pressure. This water pressure has the ability to remove plaque and easily removed unwanted debris from in between your teeth, similar to regular flossing but more effective. The high pressure of the water pushes food particles that are trapped between teeth, massages gums, and removes plaque buildup from your teeth, all in minutes. Waterpik machines have proven to be a very effective way to gain and maintain excellent oral hygiene. They can reach placed that floss typically can’t. 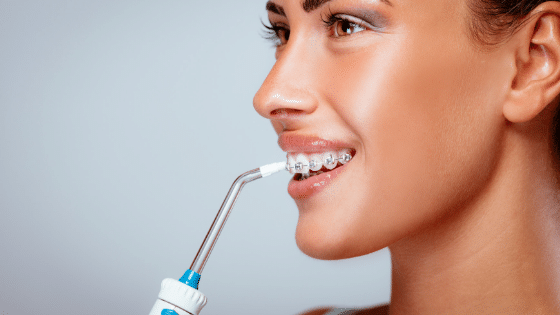 Water flossing is particularly effective for those with braces or other dental wear that can make flossing tricky and create more hard to reach places. Though these machines are a bit of an investment, they have proven to be worth it. A Waterpik machine is very user-friendly. Though it is not as mobile or as easy as traditional floss, it is more effective. Once you get your machine, plug it in and adjust the pressure to your desired strength. Leaning over the sink, place the tip of the Waterpik device in your mouth, closing your lips around the device. Turn on your Waterpik and start with the back teeth, working your way forward. Aim the tip of the device just above your gumline, working through each tooth. Spit out the water as you go. The water pressure from a Waterpik doesn’t just remove debris from your teeth, but it also washes away plaque and reaches other potentially infected parts of your mouth. Because tradition flossing uses the same string the thread through your teeth, it has the ability to cross contaminate bacteria throughout your mouth. Whereas water picking uses fresh water and high pressure to clean out hard to reach places, and then you spit out the water and move to the next spot. Plaque is always building on your teeth; water picking can help to rid your mouth of it! Clinical trials have proven that the Waterpik is more effective than flossing when it comes to removing plaque. The power pulsation and water pressure involved in water picking are able to not only remove more plaque but also remove plaque in difficult places that traditional floss just can’t reach. When those hard to reach places are left alone, plaque and bacteria can build up and cause tooth decay and gum disease. If your gums are swollen and bloody when you floss or brush, you are experiencing the beginning stages of gum disease. Periodontal and gingivitis are common gum disease caused by bacteria build up from plaque. Gingivitis can be reversed with good oral hygiene—brushing and flossing daily. When gingivitis is not reversed and is allowed to worsen, it becomes periodontitis, which is not reservable. A Waterpik is an effective way to combat gum disease and reverse gingivitis.